On Colin Kaepernick’s Nike Ad: Will the Revolution Be Branded? Colin Kaepernick is now the face of Nike, which raises questions we should not be afraid to ask. Immediately, this sent social media into paroxysms of confusion. Liberals and left-wing commentators found themselves largely praising the brave decision by the global sneaker behemoth, promising to buy some Nike products to show support for the move. 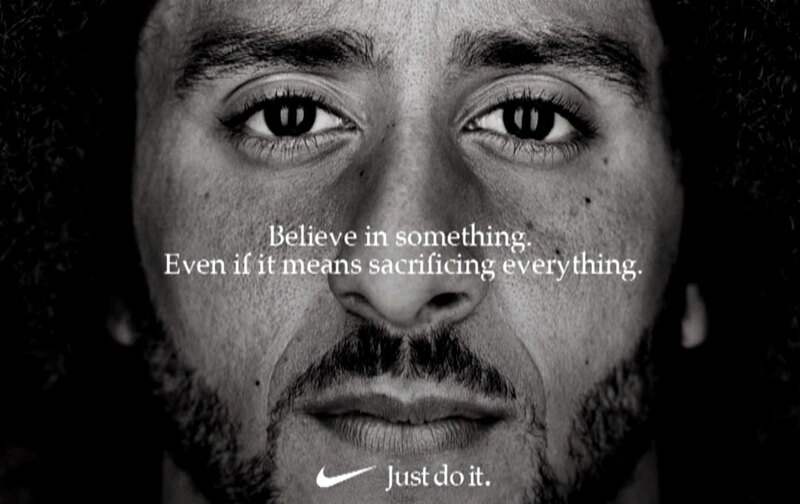 Others on the left stopped short of singing Nike’s praises but saw it as a victory for Kaepernick: He stood by his principles and now has a sweet shoe deal to show for it, which for many, further legitimizes his decision to protest. On the right, there were calls for demonstrations against the sneaker company. #BoycottNike trended on Twitter. Scenes of people burning their sneakers or cutting the swooshes off of their clothes also went viral. This is a head-spinning set of circumstances. Nike has for decades been a target of protests by student activists, with organizations like United Students Against Sweatshops on the front lines, for notoriously poor labor practices. Earlier this year, the company was accused of fostering a sexist work environment with chronic harassment. The opening line of a New York Times exposé was “For too many women, life inside Nike had turned toxic.” Then there is Nike co-founder and chairman emeritus Phil Knight, who gave $500,000 in 2017 to Oregon Republican gubernatorial candidate Knute Buehler. When it comes to marketing, for three decades—from Spike Lee’s famous Air Jordan ads and John McEnroe’s “Rebel With a Cause” campaign to its current campaigns featuring LeBron James and Serena Williams—Nike has used the image of rebellion to sell its gear, while stripping that rebellion of all its content. As Gino Fisanotti, Nike’s vice president of brand for North America, told ESPN, “We believe Colin is one of the most inspirational athletes of this generation, who has leveraged the power of sport to help move the world forward.” The idea that Nike executives would position themselves as messengers of Kaepernick’s righteous years-long struggle is, to put it mildly, galling. In Nike’s antiseptic, hollow corporate-speak, Kaepernick is simply “moving the world forward.” There is no mention here of police violence or racism. And it would be stupid to expect it. This is Nike. Asking them to be a voice for social justice is like asking a dog to meow. All of that being said, this is a case more complicated than just calling out Nike for commodifying dissent. Kaepernick has spent the past two years being showered with hatred and death threats, vilified on social media and from the presidential bully pulpit. In the last year, he has given away over a million dollars of his own money. He has been unable to earn a living during the prime years of his career. It is a great thing that he is actually going to earn an income and receive funding for his activist works. It is satisfying that after two years in the political wilderness, he is getting an outpouring of support from those defending an ad with a message that reinforces the power of political sacrifice. Nike is the official sponsor of the NFL, so this ad campaign is a thumb in the eye of every owner who has colluded against him. Imagine the first time this ad plays during the commercial of an NFL game. Jerry Jones’s head might explode clean off his body. So, good for Colin Kaepernick. But global, multibillion-dollar corporations that run an archipelago of sweatshops don’t underwrite rebellions. They co-opt and quash them. If anyone can navigate this snakepit, it is Colin Kaepernick, but it won’t be easy. The revolution will not be branded. We should be honest about that. The message of standing up to police violence and racial inequity shouldn’t end up in a swoosh-laden graveyard. That’s the risk that comes with this sponsorship. But if anyone has earned the right to take that risk, it’s Colin Kaepernick.